The huge Auschwitz camp in Poland, the Third Reich's most gruesome death camp, contained not only the infamous concentration camp - whose horrors are well-documented - but also a prisoner-of-war facility that housed British inmates. Situated close enough to the Jewish quarters to smell the stench of burning bodies from the crematoria, the POWs were forced to work alongside concentration camp inmates in a Nazi factory. Witnesses to daily violence, the men survived beatings, hard labour and the extreme cold of Polish winters, whilst subsisting on meagre rations. Their final ordeal was to march hundreds of miles, in the depths of winter, to secure freedom in the spring of 1945. Allies in Auschwitz records an important and forgotten episode of modern history. 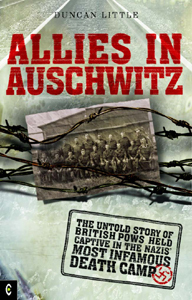 As corroboration of the men's testimony, the final chapter includes post-war accounts from other British POWs held in E715 Auschwitz, based on documents compiled by war crimes' investigators for the Nuremburg Trials.